The Dow is 5% shy of its record closing high reached five years ago today. Click the chart for more stock market data. U.S. stocks fell Tuesday as investors gear up for the unofficial start of the third-quarter earnings season but despite the day's weakness, the Dow and S&P 500 continue to hover near five-year highs. In fact, the Dow is about 5% away from its all-time closing peak of 14,164.53, reached exactly five years ago today, while the S&P 500 is about 8% away from its record closing high of 1,565.15. The Nasdaq has been trading near its highest levels since November 2000, but has a way to go before it reaches its record high above 5,000 reached in March 2000. 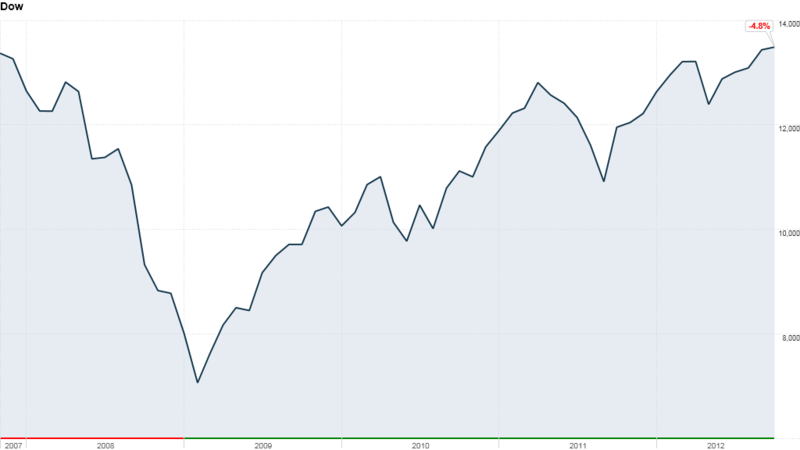 Stocks have made a considerable comeback after hitting lows in March 2009 following the financial crisis. The gains have been largely fueled by stimulus measures from the Federal Reserve, as well as strengthening balance sheets in Corporate America. But slowing global growth and debt problems in Europe and the United States -- particularly the looming U.S. fiscal cliff -- are causing investors to worry that the rally has come to an end for now. Corporate America will be back in the spotlight over the next few weeks as companies open up their books. Analysts are expecting third-quarter earnings for the S&P 500 to decline 1.2%, according to S&P Capital IQ. That would be the worst result for stocks since the third quarter of 2009. Aluminum producer Alcoa (AA), considered a bellwether of the economy because of its global reach, reported earnings and sales that topped forecasts after the closing bell. Shares rose about 1% after hours. KFC and Taco Bell owner Yum Brands (YUM) also reported results Tuesday. Sales missed forecasts but earnings beat estimates. Shares rose more than 3% after hours, a possible sigh of relief that the company, which has a big presence in China, reported same-store sales growth of 6% in China. The week will culminate with the first big bank earnings: JPMorgan Chase (JPM) and Wells Fargo (WFC) are both set to report before the market opens on Friday. Until investors get more clarity on both the earnings and economic front, trading will likely remain in a tight range. 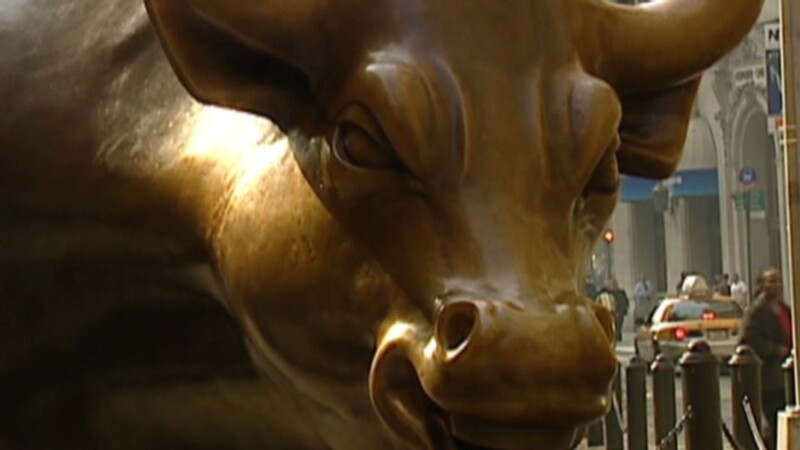 The Dow fell 0.8% Tuesday, while the S&P 500 declined 1% and the Nasdaq fell 1.5%. Tech stocks were among the biggest laggards, with Intel (INTC), Microsoft (MSFT), Netflix (NFLX) and Baidu (BIDU) all trading lower. Apple (AAPL) shares traded down for a fourth straight day. Some of the weakness was driven by the International Monetary Fund's discouraging forecast for global growth, said analysts at Wells Fargo Advisors. Late Monday, the IMF projected world economic growth of 3.3% this year, down 0.2% from its forecast in July. The IMF was also more pessimistic about 2013, expecting growth of only 3.6% -- down from its previous forecast of 3.9%. It also said Italy, Spain and others will likely miss budget deficit targets this year. On Tuesday, European Central Bank President Mario Draghi testified before the European Parliament about Europe's debt problems. Draghi said eurozone interest rates are as low as they need to be, and he reiterated that the central bank was ready to start its new sovereign bond purchase program. Both events put pressure on the euro, which edged below $1.30. Also Tuesday, German Chancellor Angela Merkel is due to meet with Greece Prime Minister Antonis Samaras, who has been seeking a two-year extension to implement tough austerity measures in order to secure the next round of bailout funds. European stocks ended lower. Britain's FTSE 100 lost 0.5%, while the DAX in Germany and France's CAC 40 dropped 0.8%. Companies: Netflix (NFLX) shares tumbled following a downgrade by Bank of America (BAC). Shares had risen 10% the previous day after an upgrade by Morgan Stanley (MS). Shares of Edwards Lifesciences (EW) sank a day after the medical device company revised down its quarterly sales forecast. Shares of drugmaker Eli Lilly (LLY) gained ground on news that its drug -- still in the testing phase -- could slow down memory decline in Alzheimer patients with mild symptoms. Shares of Wells Fargo (WFC) fell after the U.S. Attorney for the Southern District of New York Preet Bharara filed a civil lawsuit against the bank. The DOJ is seeking hundreds of millions of dollars in damages for what it alleges was mortgage fraud at the bank. Commodities: Oil for November delivery rose $3.06 to $92.39 barrel. Gold futures for December delivery fell $9.40 to settle at $1,765 an ounce. Bonds: The price of the benchmark 10-year U.S. Treasury rose, pushing the yield down to 1.72% from 1.75% late Friday. The bond market was closed on Monday for the Columbus Day holiday.